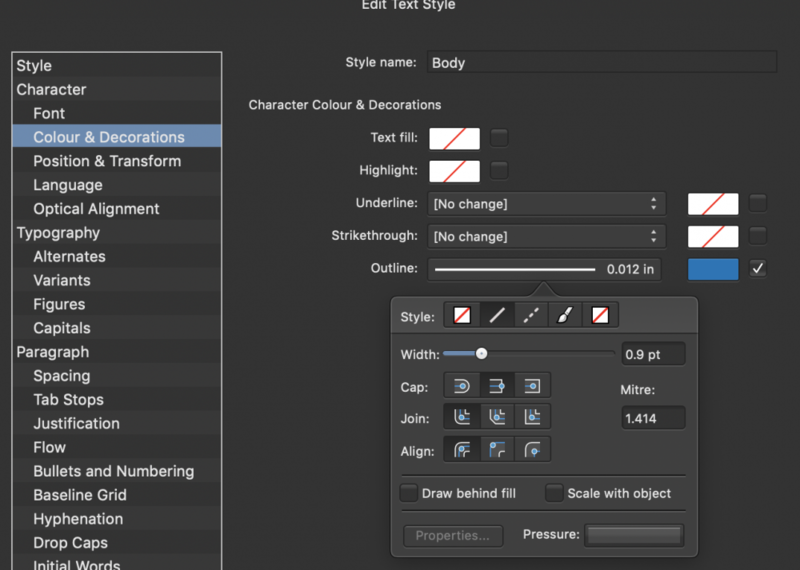 I have not found it yet, but is there/could there be an option to choose a stroke style like double rules thin/thick etc (see InDesign or Quark [remember that?]). This would be useful when designing traditional looking documents. You can fake it by using multiple objects, but that's messy. It doesn't exist in Affinity Designer, but it would be of little use there in an illustration app. Further to the stroke/fill topic, I am trying out strokes and fills on text frames. 1. Select a text frame with the move tool and use the stroke and/or fill palettes to apply a stroke and/or fill and it applies the result to the text, even though the frame, not the text is selected! Not what I'd expected. This I would only expect to happen when text is high-lighted with the text tool, which it does. 2. O.K. so you have to use the text frame dialogue to do this, but it doesn't yet give the options for stroke alignment or join styles. 3. Maybe I've been using InDesign too long and expect the same behaviours here. I guess you can't copy Adobe practices too closely. Are you looking for this? If you click on the line next to outline, you get the normal Affinity stroke options. Ah ha! It was frame strokes and borders I was looking for, but your post prompted me to look at a similar drop-down in the contextual tool-bar or the text frame dialogue. Query solved! Hi GeoffM33 - I don't see a way to have double rules. Have you found one? No, nor me so far. I've been doing an experimental booklet to test the software, and I've come up with a work-around: Either put two different rules next to each other (and maybe group them if you like), or stack two rules on top of each other, make them different weights, biggest underneath, and colour them differently. This last will work better with frames and boxes: make the frame, give it a wide stroke, give it a fill if you like, duplicate it so it's bang on top, give the copy a finer rule and colour the rule differently (e.g. the page colour, say) and take the fill off. And save as an asset for reuse. Double rules can be copied & pasted from InDesign as separate objects which can be coloured and grouped but for some reason the outer one comes as a curve which can't have round corners whereas the inner ones comes as a rectangle which can have round corners. We definitely need more stroke styles AND the ability to put corner styles onto text frames. 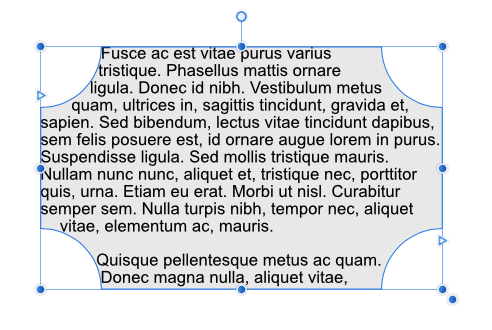 I would also really want to see special corner styles for more elaborate flourishes that don't stretch and squash when you resize the box. th﻿e ability to put corner styles onto text frames. Beyond the corner styles you already have available? Or have you not discovered those yet? Next to the line icon there is Dash Line icon. You should be able to achieve a similar effect there. Although bevel and miter joints seem to behave in a similar manner. This could be a bug. I have tried the various settings there and nothing gets me to the symmetric box I'm looking for. I've noticed that too. The devs will need to look at it again. I would suggest to report it as a bug or a feature request for the dotted pattern to match corners. This is not a bug. It a feature that wasn't implemented yet (also valid for Designer). Hopefully it will be implemented in a future update later. Thanks MEB - in the meanwhile copy & paste from Illustrator works well here. No, I wasn't talking about stroke corners. My fault for not being clear. 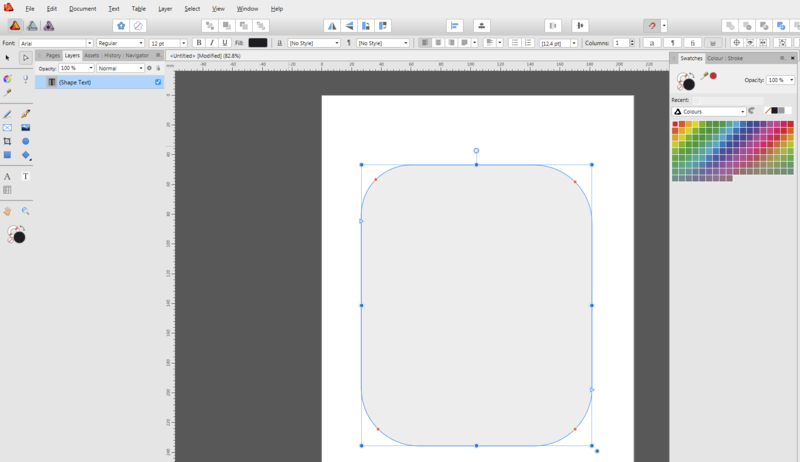 When you insert a rectangle you have options to create rounded, angled, concave or cutout corners. IMO those same options should be available on (rectangular) text frames too. 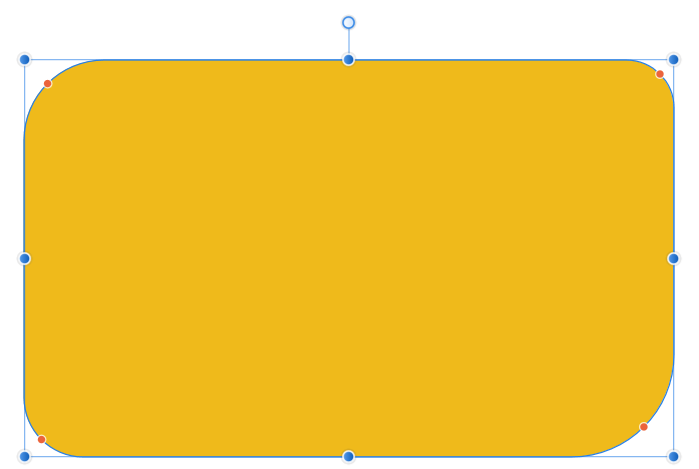 As a workaround, you can create a rectangle with the corners you want, then Layer > Convert to Text Frame or (select and click in it with the Frame text tool). Thanks! That's not really achieving what I want however: It becomes a shape, not a border and I lose the ability to modify the corners. Good to know tho. 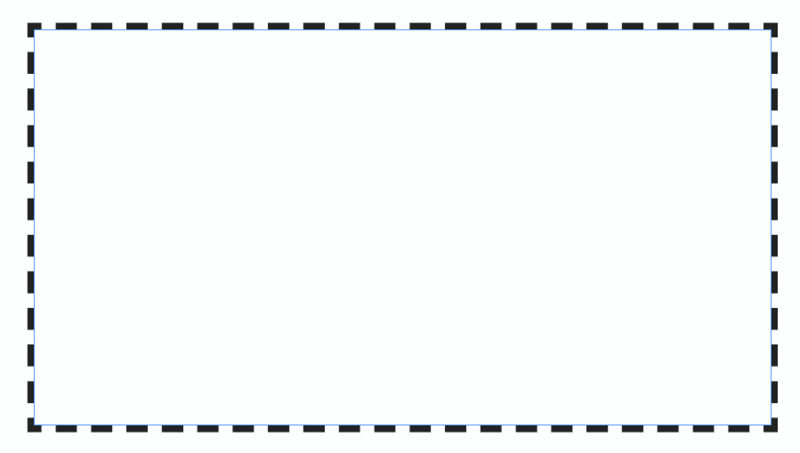 If you give the corners a value and a corner shape before you Convert to Text Frame you should be able to change the corner value but not the corner shape after you have converted to a text frame. That's not really achieving what I want however: It becomes a shape, not a border and I lose the ability to modify the corners. You can create a border (stroke) before you convert it to a Text Frame (via the context menu), or after you convert it (via the Text Frame panel). After you make it a Text Frame, you can still adjust the corners (e.g., make the concave corners more or less concave) using the Node Tool, though you cannot change the corner style to a different one. 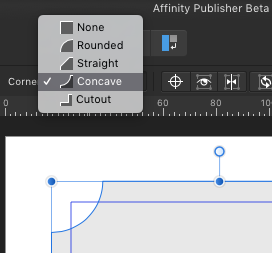 It looks like changing the corner size has to be done visually with a mouse rather than entering a value somewhere, which makes it much less useful IMO. For your information all radius can be changed in absolute sizes or in percentage value. Hi Typo998 - I only get these options before I have converted to a Text Frame. Once I have converted to a Text Frame only the 4 red nodes are available for changing the curvature. There is nothing on the Context Toolbar for that. I think this happen when single radius is check, try to uncheck it. The single radius is definitely unchecked. I think the screenshot you uploaded showing 4 nodes + property bar with input details showed a shape that had not been converted to a text frame. Here's a screenshot after converting to frame text. The 4 nodes are adjustable but not numerically, only by moving with a mouse.